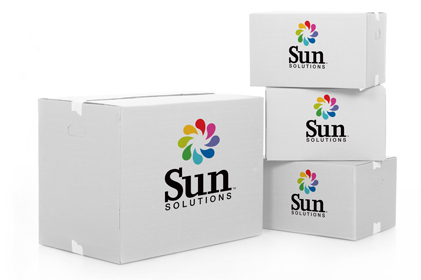 Sun Solutions provides a variety of fulfillment services to meet your needs, whether you need our team to fulfill a single print job to multiple locations or to manage and fulfill your entire inventory of print collateral, sales kits, and promotional items. Save floor space in your office and your time by letting Sun Solutions fulfill your print collateral, sales kits, promotional merchandise, documents, and so much more. Let our team take care of all the details and get your shipments delivered on time. 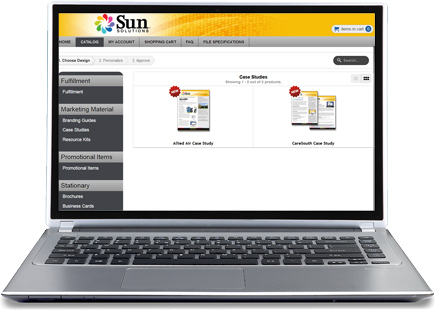 Sun Solutions offers custom-branded online storefronts to give you the power to order online, view inventory levels, view and approve orders, download electronic collateral, and manage user access. Our clients can use their storefront for internal ordering only or as online ecommerce sites accessible by the general public. What can we manage and fulfill for you?